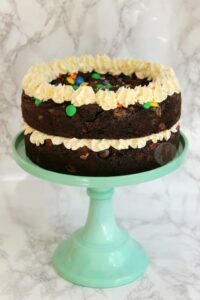 A Super Chocolatey Two Layer Cookie Cake made out of Two Giant Triple Chocolate Cookies with Vanilla Buttercream Frosting! The other week I posted my M&M Cookie Bars recipe and they were such a massive hit – Like, so many of you had made them on the same day I posted the recipe, and this continues to happen every single day. However, when it was one of my closest friends birthdays recently, I knew I had to make her something AMAZING and delicious that would be a little ‘next level’… Hello Giant Triple Chocolate Cookie Cake. 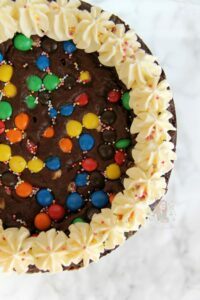 I used the recipe for my M&M Cookie Bars as it was just such a success and was just SO delicious I couldn’t actually cope, and added in some Milk Chocolate Chips and White Chocolate Chips to make it even more chocolatey and delicious. Some people may say that the chocolate chips are not necessary, but I like the difference between the normal chocolate chips and the M&M’s. They create a different texture and flavour and just make it heavenly. 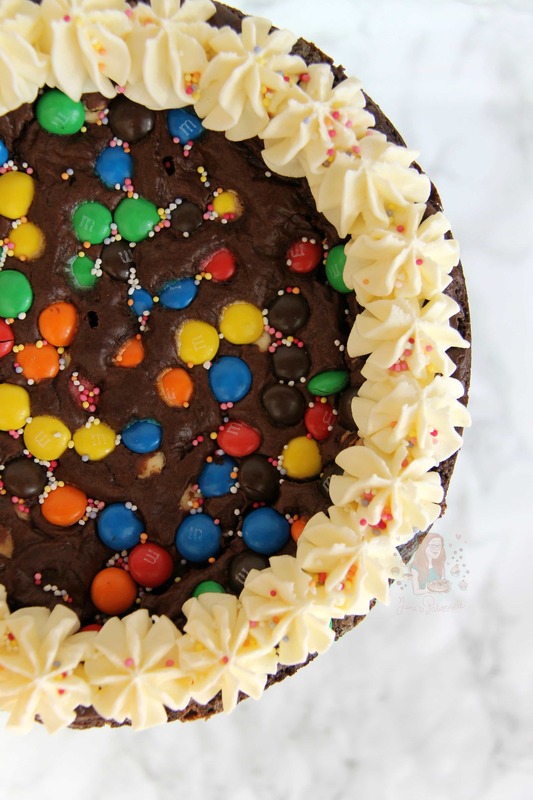 As it was my friends birthday, I wanted to make the treat look like a cake so I simply doubled the M&M Cookie Bars recipe, and split between two 8″/20cm tins and baked for a bit longer. They ended up sinking a little in the middle, but I guess its because its such a large cookie that that is often the case, and it ended up being the perfect little area for the buttercream to be on the bottom layer, and just looked delicious on the top. Like seriously, just look at all those bright and colourful M&Ms just there in the cookie… YUMMY. I seriously hope you guys love this beauty as much as I and the birthday girl did… enjoy! 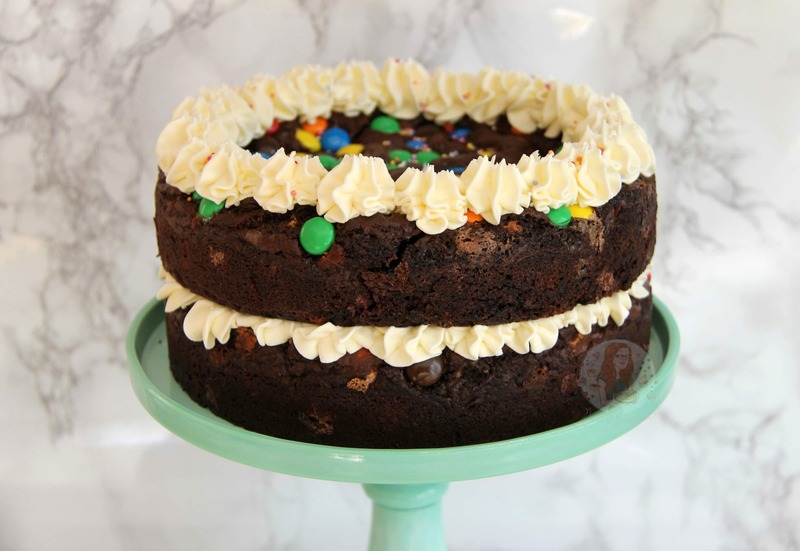 This recipe makes a double layer Giant Cookie Cake! 1) Preheat your oven to 190C/170C Fan and line Two 8″ Circle Cake Tins with parchment paper, and leave to the side for now. 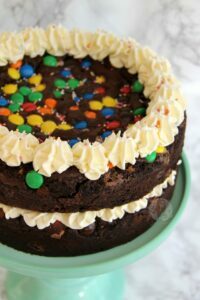 4) Add in the Dry Ingredients, the two different chocolate chips, the M&M’s, and mix with a spatula till a thick cookie dough is formed. 6) Leave the cookies to cool in their tins for about 10 minutes, then leave to cool fully on a wire rack. 7) In a stand mixer, beat your butter for a couple of minutes till really smooth and supple. Add in the Icing sugar 1/2 at a time and fully beat in before you add the other half. Add in the Vanilla Extract and beat the buttercream for about 4-5 minutes until smooth and fluffy. If you think its still a little stiff, add in a couple of tbsps of whole milk, or boiling water and beat till you have the texture you want. 8) On top of your favourite cookie, pipe little ‘stars’ of buttercream frosting around the edge and sprinkle on some cute sprinkles (like you can see in the pictures). Spread or pipe the rest of the frosting on top of the other cookie. Put the better cookie with the frosting stars on top and you’re done! Enjoy! 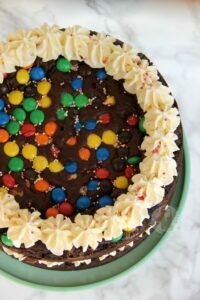 This delicious recipe is based on a recipe by Crunchy Creamy Sweet which I have adapted to grams, and swapped up slightly from my M&M Cookie Bars post to create a double layer cookie cake. I used oodles of Chocolate M&Ms in this recipe, and the colour on them stayed perfect even after baking, but I’m sure it would work with the Crunchy M&M’s, the Peanut M&M’s, or even smarties for example, and you could just use all chocolate chips, or all M&Ms if you wish – but as I explained earlier on, I liked the mixture. This amazing Cookie Cake will last for 3 days after baking, but I won’t be surprised if it lasts less than a day. Find my other Cookie, Chocolate & Cake Recipes on my Recipes Page! Older Next post: No-Bake Triple Chocolate Cheesecake! Newer Previous post: Strawberry Oreo Fudge! Do you know if it is freezable prior to the frosting stage of course? 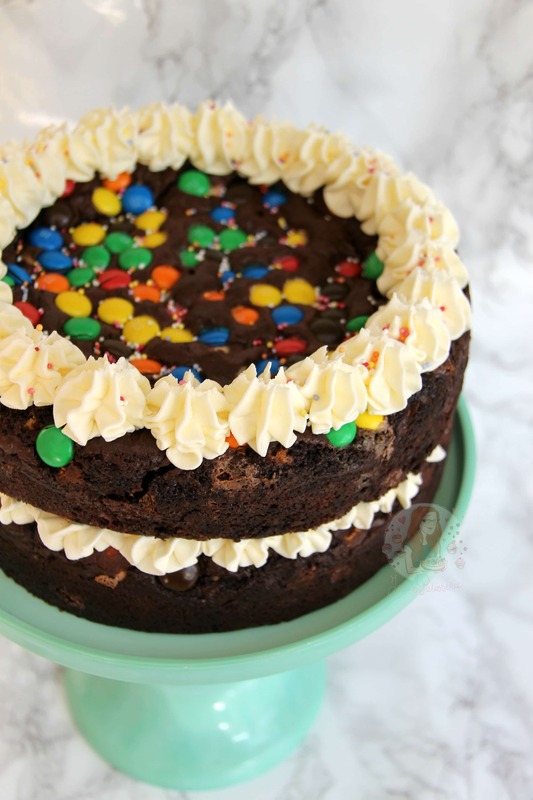 This looks amazing and im making this for my sisters birthday tomorrow…she’ll be 23 but loves cookies, so thought this would be a fun cake for her to have!!! She doesnt know im making her a cake, so it will be a lovely surprise for her! You’re recipes are amazing and so lovely, thank you for sharing them with us! This looks amazing. It’s my daughter’s birthday soon and she doesn’t like sponge cake so this will be just perfect! Haha yes! It’s the perfect alternative to actual cake! This looks perfect for my daughter’s next birthday party!!! Mmmmm can’t wait to give it a try! Awh yes!! I hope you and she love it!